The Regional Greenhouse Gas Initiative (RGGI) is the Northeast’s innovative regional program to limit carbon pollution from power plants. RGGI has already been a powerful force in cutting air pollution, lowering energy costs and driving the clean energy economy across the regions, and making RGGI stronger by lowering the pollution cap will only make the states stronger. below 2001 levels by 2030. 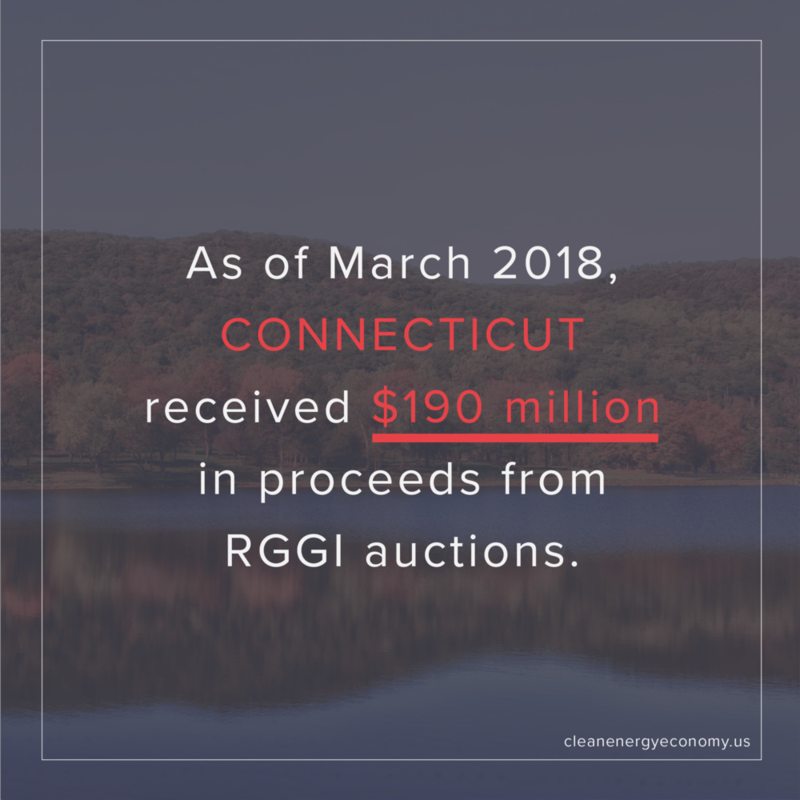 As of March 2018, Connecticut received $190 million in cumulative RGGI proceeds. HOW DOES CONNECTICUT USE ITS PROCEEDS? In the period from 2008-2015, Connecticut received $155.3 million in RGGI auction proceeds. These proceeds fund home energy audits, discounted lighting products, and incentivize the construction of more energy efficient homes. RGGI also supports lighting retrofit projects for commercial and industrial facilities, helping businesses save energy and money. Additionally, RGGI proceeds enable low-interest financing for clean and renewable projects. As a result of these efforts and investments, Connecticut is ranked 6th in 2017 State Energy Efficiency Scorecard developed by the American Council for an Energy-Efficient Economy (ACEEE).In addition, a report found that from 2012-2014, RGGI led to $56.2 million of economic value in Connecticut. RGGI-driven reductions in CO2 emissions have been accompanied by significant reductions in co-pollutants like sulfur dioxide, nitrogen oxides and particulate matter. Reduced emissions of these co-pollutants results in reduced incidence of heart attacks, asthma, and other respiratory illnesses. Analysis from Abt Associates shows that RGGI was responsible for as much as $353 million in avoided health costs in Connecticut from 2009-2014. Across the state, there is strong support for taking action on climate change. According to the 2016 Yale Climate Opinion Maps, 72 percent of Connecticut residents understand global warming is happening now, and 77 percent support regulating CO2 as a pollutant. RGGI is proudly helping Delaware to reduce greenhouse gas emissions and promote energy efficiency and renewable energy. As of March 2018, Delaware received $109.8 million in cumulative RGGI proceeds. HOW DOES DELAWARE USE ITS PROCEEDS? From 2008-2015, Delaware received $84.7 million in proceeds from RGGI auctions. A portion of these proceeds goes to the non-profit organizations Delaware Sustainable Energy Utility, Delaware Department of Natural Resources, and the Low-Income Heating Assistance Program. These institutions provide residents and businesses with funding for energy efficiency improvements and clean energy projects. RGGI proceeds are also used for projects that reduce greenhouse gas emissions, support climate change adaptation projects, and the Delaware Low-Income Weatherization Assistance Program. In addition, some funding is directed to provide direct bill assistance to offset heating costs for low-income Delawareans. From 2012-2014 the RGGI program led to $107.3 million of economic value in Delaware. 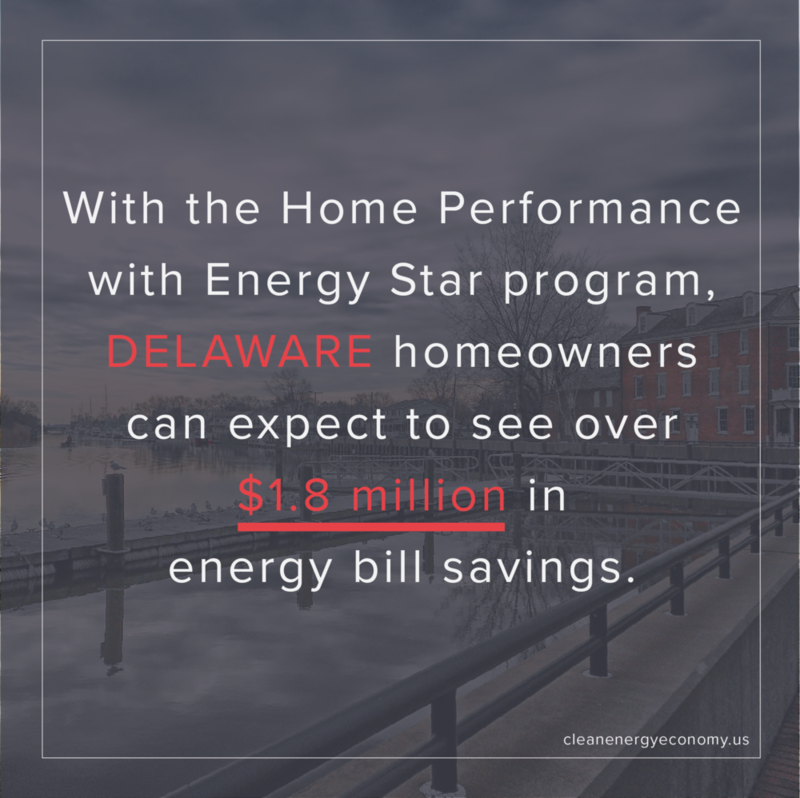 In 2015, the Home Performance with Energy Star program saved 570 MWh of energy for over 900 Delaware homeowners. Over the lifetime of the program residents can expect to see over $1.8 million in energy bill savings. Delaware has a target to reduce greenhouse gas emissions 30 percent from 2008 levels by 2030. These goals are supported by polling in the state which finds that 76 percent of Delawareans support regulating CO2 as a pollutant. RGGI is helping Maine residents and businesses conserve energy and lower energy bills. As of March 2018, Maine received $94 million in cumulative proceeds. HOW DOES MAINE USE ITS PROCEEDS? From July 2012 – June 2017, Maine invested $54.4 million in RGGI auction proceeds. Nearly all of that (95 percent) was used for consumer benefits, with the majority (79 percent) for energy efficiency improvements that save $5 for every $1 invested. Over the lifetime of the investments, programs funded by RGGI proceeds over the last five years are conserving more than 1.2 billion kwh of electricity (that’s as much power as 22,000 Maine homes use in a year), and lowering participants’ energy bills by more than $277 million. According to a recent report, in the period from 2012-2014 alone, the RGGI program led to $122.3 million of economic value in Maine. RGGI provide the majority of funds that Efficiency Maine uses to help Maine homes invest in energy efficiency upgrades that reduce heating oil use and costs. This means helping homeowners invest in insulation, air sealing, high-efficiency heating equipment, heat pumps and more. RGGI-funded Efficiency Maine programs also included a commercial program that helps businesses, schools, hospitals and others lowers heating and electricity costs, as well as a large industrial program that is helping Maine manufacturers and other energy-intensive businesses sustain jobs and stay competitive. Across the state, there is strong support for clean energy and RGGI. A fall 2016 poll by the Natural Resources Council of Maine found 77 percent of likely voters support using RGGI to decrease carbon pollution by 5 percent per year. RGGI is helping Maryland to promote affordable, reliable and clean energy across the state. As of March 2018, Maryland received $594 million in cumulative proceeds. HOW DOES MARYLAND USE ITS PROCEEDS? Between 2008 and 2015, Maryland received $439.5 million in RGGI auction proceeds. The state invests its proceeds into the Strategic Energy Investment Fund, which supports energy efficiency upgrades for low- to moderate-income households, helps businesses improve energy efficiency, and supports residential renewable projects. The RGGI program led to $213.8 million of economic value in Maryland from 2012-2014 period alone. RGGI’s goals are supported by Maryland residents. Three-quarters of Marylanders understand that global warming is happening now, and 78 percent support regulating carbon dioxide as a pollutant. RGGI is helping Massachusetts reach its goal of reducing greenhouse gas emissions by 80 percent below 1990 levels by 2050. As of March 2018, Massachusetts received $480 million in cumulative proceeds. HOW DOES MASSACHUSETTS USE ITS PROCEEDS? Through 2014, Massachusetts invested $304.6 million in RGGI auction proceeds. The state has invested these proceeds in programs to reduce harmful pollution, build the Commonwealth’s clean energy economy, and increase the predictability of energy costs for homes and businesses. Notably, 80 percent of RGGI proceeds are used to fund Massachusetts’ nation-leading energy efficiency programs. From 2012-2014, RGGI generated $243.3 million of economic value in Massachusetts. Energy efficiency programs supported by RGGI have saved families and businesses more than $691 million in lifetime energy costs. Massachusetts tops the nation in the 2017 State Energy Efficiency Scorecard developed by the American Council for an Energy-Efficient Economy (ACEEE). Across the Massachusetts, there is strong support for clean energy and RGGI. A recent poll by the Sierra Club found 84 percent of Bay Staters supporti Massachusetts’ participation in RGGI. Furthermore, according to a Yale poll, 74 percent believe global warming is happening now, and 78 percent support regulating CO2 as a pollutant. HOW DOES NEW HAMPSHIRE USE ITS PROCEEDS? From 2008-2015, New Hampshire invested $100.7 million of RGGI auction proceeds to fund efficiency measures and provide direct bill assistance to residents. The programs successfully helped to weatherize homes, upgrade municipalities’ equipment to highly efficient models, and financed residential energy efficiency projects. and hosted workshops to educate stakeholders on energy code. From 2012-2014 RGGI generated $67.3 million of economic value in New Hampshire. Across the state, there is strong support for clean energy and RGGI. According to Yale Climate Opinion Maps, 75 percent of New Hampshire residents support regulating CO2 as a pollutant. Even more, a Sierra Club poll found 68 percent supporting New Hampshire’s participation in RGGI. New Jersey was a founding member of RGGI, but was withdrawn from the initiative by then Gov. Chris Christie in 2011. WILL NEW JERSEY PARTICIPATE IN RGGI? Despite three attempts by the New Jersey Legislature to rejoin the RGGI, Gov. Christie’s vetoes kept New Jersey from participating in RGGI for seven years. This led to the state falling behind in its emissions targets and foregoing $279 million in revenue from RGGI auction proceeds. In January 2018, 16 days into office, Gov. Phil Murphy signed an executive order directing New Jersey to rejoin the Regional Greenhouse Gas Initiative. New Jersey is poised to begin participation in RGGI in 2020, following an extensive stakeholder process and finalization of regulations by the New Jersey Department of Environmental Protection. A report by the National Association of Regulatory Utility Commissioners found that New Jersey’s participation in RGGI created $151 million in economic value and almost 1,800 jobs in the state. In April 2018, the New Jersey Legislature passed a clean energy bill to upgrade New Jersey’s renewable portfolio standard to 35 percent by 2025 and 50 percent by 2030. The clean energy bill would establish a cost-effective energy efficiency program. It calls for a 2 percent reduction in electricity use each year, which would decrease carbon emissions from the power sector by about 350,000 metric tons annually – equivalent to taking approximately 75,000 cars off the road each year. As of September 2016, New York received more than $1 billion in cumulative proceeds. HOW DOES NEW YORK USE ITS PROCEEDS? Between 2008 to 2015, New York received $896 million in RGGI auction proceeds. The state invests RGGI proceeds to support deployment of energy efficiency, renewable energy and carbon abatement technology. RGGI-supported investments build New York’s capacity for long term carbon reduction through community and business focused solutions. RGGI proceeds are also invested in programs that provide tools, resources and technical assistance to local governments, so they can implement climate and clean energy actions. The state’s efforts to advance market scale for clean energy will help the state achieve its goals of reducing greenhouse gas emissions and combating climate change. Further, New York is fostering energy efficiency market developments to scale, providing greater carbon reductions and consumer cost savings. According to a recent report, in the period from 2012-2014 alone, the RGGI program led to $385.5 million of economic value in New York. Across the state, there is strong support for clean energy and RGGI. A Sierra Club poll found 76 percent supporting New York’s participation in RGGI. HOW DOES RGGI USE ITS PROCEEDS? Rhode Island received $48 million from RGGI auction proceeds from 2008-2015. These proceeds are allocated to drive investment in clean energy resources, including cost-effective energy efficiency and renewables. The state’s primary electric utility, National Grid, received RGGI proceeds to support the implementation of energy efficiency programs, as well as energy efficiency rebates for homes heated with oil and propane. The Rhode Island Solarize program also received funds from RGGI to increase the adoption of small-scale solar electricity. In addition, RGGI funds were used for grants to K-12 schools in support of their adoption of renewable energy projects. RGGI proceeds are helping Rhode Island increase clean energy adoption across the state. Programs funded with RGGI proceeds have led to statewide adoption of energy efficiency measures, earning Rhode Island a rank in the top 3 of the 2017 ACEEE State Energy Efficiency Scorecard. 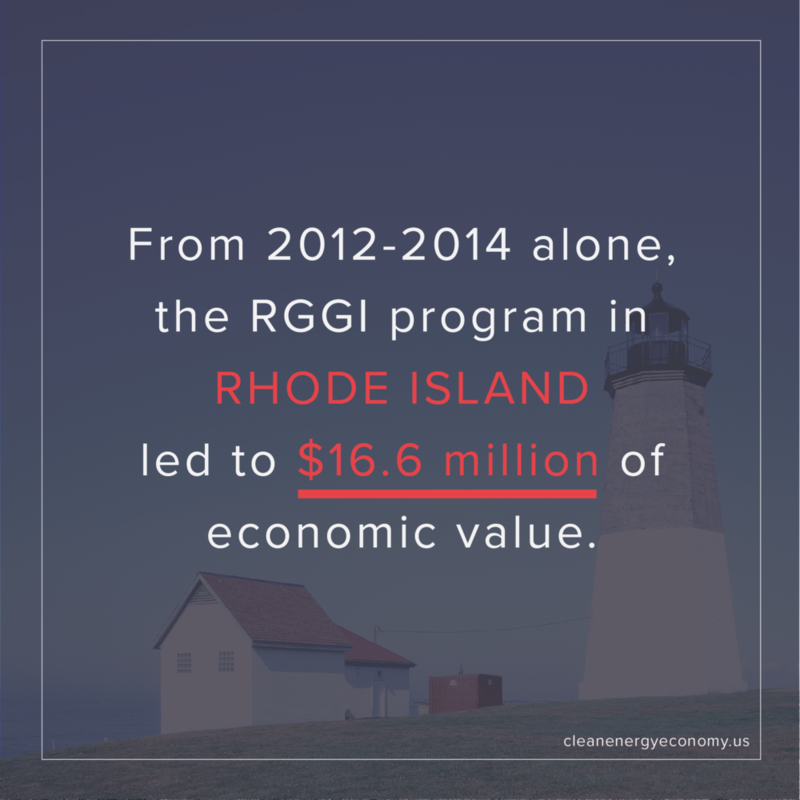 According to a recent report, in the period from 2012-2014 alone, the RGGI program led to $16.6 million of economic value in Rhode Island. HOW DOES VERMONT USE ITS PROCEEDS? Vermont received $17.8 million in RGGI auction proceeds from 2008-2015. The proceeds are used to fund programs managed by Efficiency Vermont and Burlington Electric Department. RGGI funds allow these institutions to expand their energy efficiency programs, including Home Performance with ENERGY STAR service for residential customers, Building Performance service providing incentives for efficiency services to small business customers, and low-income energy efficiency services through 3E Thermal project management. According to one report, in the period from 2012-2014 alone, the RGGI program led to $14.8 million of economic value in Vermont. Programs funded by RGGI proceeds have helped residential consumers with home efficiency, small businesses with building efficiency and low-income households through community programs. As a result of the success of these programs, Vermont ranked 4th in the 2017 State Energy Efficiency Scorecard developed by the American Council for an Energy-Efficient Economy (ACEEE). Virginia has approved draft regulations to link to RGGI and participate in the program through 2030.
will virginia participate in rggi? Virginia does not currently participate in RGGI, however, in November 2017, the Virginia State Air Pollution Control Board approved draft regulations to link to the market. The link permits Virginia to participate in the program through 2030. By linking with RGGI, Virginia power providers would be able to trade within the wider RGGI market through a consignment auction. This means that Virginia regulators would give away allowances instead of selling them and that Virginia’s Department of Environmental Quality (DEQ) would not have decision-making power about where auction proceeds are invested. Legislative action is required for Virginia to formally join RGGI. This has already been proposed with the Virginia Alternative Energy and Coastal Protection Act. Virginia’s power plants put out nearly 34 million tons of carbon dioxide in 2016, up from 31 million in 2011. By formally joining RGGI, the state would place a long-term cap on carbon pollution beyond 2030. As a formal member of RGGI, state regulators at the Virginia DEQ would have the authority to sell allowances to power providers and invest the revenue in projects to mitigate climate change. Virginia is projected to receive up to $200 million in auction proceeds per year.